The U16 Basketball Saints travelled to Crestwood Prep to take on behemoth Elijah Fisher and their U16 squad. 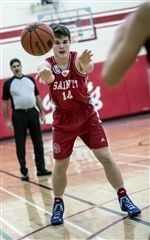 The First Basketball team headed to Ridley College on Monday, February 4 for a must-win game to keep their CISAA playoff hopes alive. It was a great match for the U16 Basketball team versus local rival Villanova. The First Basketball team hosted UCC in a rematch of their recent battle in Toronto. The U16 Basketball Saints faced off against UCC in the warm and safe confines of the Yuill Gymnasium. The First Basketball team squared off against UCC in an important league matchup. The First Basketball team hosted Ridley College Saturday morning for a critical CISAA league game. Coming off the December break and into a tournament, shorthanded, is never a good thing for confidence.